As the upgraded version of Griffin RTA, Griffin 25 Plus will satisfy higher demands of vapers by providing larger tank capacity of 5ml and more airflow control. 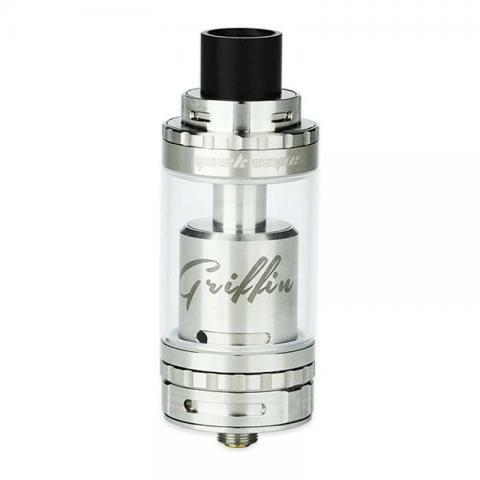 As the upgraded version of Griffin RTA, Griffin 25 Plus will satisfy higher demands of vapers by giving larger tank capacity of 5ml and more airflow control. It comes with both top and Kennedy style bottom airflow with top airflow set, if you just bottom airflow, it’s ok, just take away the top airflow set. With outside diameter of 25mm and height of 49.5mm, Griffin 25 plus will look good on big box mod, such as RX200s or RX2/3. It’s highly recommended to vapers who strive for stronger vapor and big tank. • Rebuildables are for experts, not for average or beginner vapers with no knowledge of how to rebuild atomizers. Super handling das teil. Echt klasseGeekVape Griffin 25 Plus. Bin sehr zufrieden. empfehlenswert.lässt sich auch sehr gut sauber hälten.sehr guter preis. The flavor and vapor of GeekVape Griffin 25 Plus RTA is excellent and all it takes is adapted to the price and quality.